This interesting surname is of Anglo-Saxon origin, and is locational from a place thus called in the Parish of Blackburn, Lancashire. The placename was originally recorded with the definite article, and the name may represent an Olde English pre 7th Century term for a fish "weir", a derivative of "hoecc", meaning hatch, or "haca", bolt. The suffix "-ing" when attached to a topographical feature implies dwellers at; hence, "dwellers at a weir". During the Middle Ages, when migration for the purpose of job seeking was becoming more common, people often took their former village name as a means of identification, thus resulting in a wide dispersal of the name. The surname is first recorded in the latter half of the 13th Century (see below), and William de Hacking, of Billington, appeared in Baines, "History of Lancashire", dated 1328. 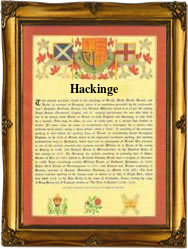 In the modern idiom the surname has many variant spellings including: Haking, Hackin, Hacking, Hackinge and Hakking. Recordings from Lancashire Church Registers include: the marriage of Grace Hacking and Nicholas Whittle on February 3rd 1597, at Great Harwood, and the marriage of Edmund Hacking and Ellena Birches at St. John's, Preston, on April 29th 1616. The first recorded spelling of the family name is shown to be that of William de Hakkyng which was dated 1283, in the "Cartulary of Whalley Abbey", Lancashire, during the reign of King Edward 1, known as "The Hammer of the Scots", 1272 - 1307. Surnames became necessary when governments introduced personal taxation. In England this was known as Poll Tax. Throughout the centuries, surnames in every country have continued to "develop" often leading to astonishing variants of the original spelling.